Based around Puccini’s Madam Butterfly, this takes the frame of the story and moves it into Saigon, Vietnam at the end of the war. It focuses on the relationship between a bar girl, supplanted from her village life into the chaos of war era Saigon, and an American GI who falls madly in love with her; their threads weave throughout the late 1970’s to take in Atlanta, USA and Bangkok, Thailand. Since its London premiere in 1989, Cameron Mackintosh’s production of Alain Boublil and Claude-Michel Schönberg’s legendary musical Miss Saigon has become one of the most successful musicals in history. 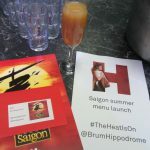 To celebrate the tour, The Hippodrome’s Circle Restaurant has launched a special summer menu to compliment the production, which we were here to taste, along with a viewing of the musical itself. We went in through the Thorp Street entrance which is a bit of a gem, hosting the Dance Exchange and a range of private venue spaces available to hire, for some pre-show nibbles and cocktails. The cocktail we tried was a Sun & Moon, Archers peach liqueur and orange juice, which was fruity and summery, setting the tone for the rest of the menu. 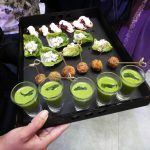 The nibbles, included pea and mint soup, and goats cheese bruschetta. 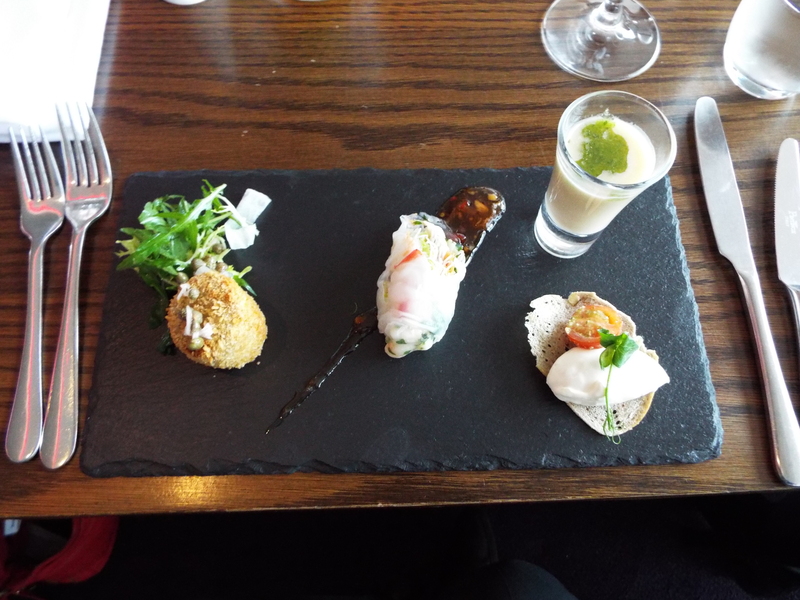 It certainly got our appetite going for our visit to the Circle Restaurant for Acts I & II of the menu. The Circle Restaurant is open usually 2 hours prior to each performance (matinees & evenings) and the menu is designed around each performance to take advantage of seasonal produce and to match the theme of each production. A boon for us bloggers, it has floor to ceiling windows overlooking the main entrance, giving wonderful light for photographs too! They’ll also hold your table for the interval so you can return for drinks or dessert without stress. White bean soup with basil pesto (V) – A good creamy delicate flavour from the white bean, giving a velvety mouth feel, this was counterbalanced by the punch of the pesto with its powerful basil lifting the savoury taste. 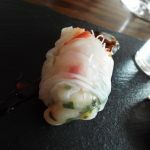 Vietnamese prawn summer rolls with sweet chilli sauce – The less well known cousin to the ubiquitous spring roll wrapped in rice paper rather than pastry. This gives it a much fresher edge than it’s deep fried cousin, with sweet chilli adding a touch of verve. 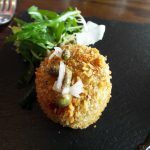 Salt beef croquette with salad of mooli, shallots and capers – My favourite from the start selection. Salt Beef is a delicious thing and its savoury texture matched well with the crispy coating. The mooli and shallots added a fresh edge but I still have my irrational hatred of capers, so they went unloved to the corner of the plate. 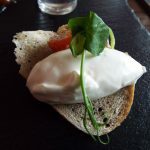 Goat’s cheese mousse with marinated tomatoes and walnut toast – Mousse was the perfect description; it was so light and airy, and made me think of a savoury take on a Mr Whippy. The marinated tomatoes were a solid accompaniment giving acidity and the walnut bread adding crisp. 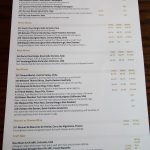 To partner all this wonderful food, I had a Marques De Morano Rioja Tinto, which was lighter than expected, and went perfectly with the tapas style light bites. With that, it was onto Act II. Chilli & coriander crusted pork tenderloin with soy & sesame braised savoy cabbage – The pork was well cooked and the coriander crust gave it an extra dimension from normal. The cabbage was divine, its soy and sesame braising really giving it some punch and this is something I’m going to be stealing for my own cabbage in future! 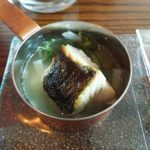 Pan-seared fillet of coley with rice noodle, samphire, ginger and spring onion broth – It’s great to see a sustainable fish getting some limelight on the menu. 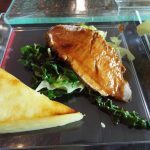 Wifey and I often have coley from the supermarket as an alternative to salmon, and it’s a solid substitute for cod or haddock. With a gentle pan searing, the fillet had kept most of its character and flaked wonderfully into the broth. The broth itself was good with samphire, salt and ginger and spring onion adding heat. I liked the rice noodles but maybe a vermicelli style rather than the Udon ones present would’ve suited the dish, as they were hard to fish out of the pan (nudge-wink). I expect this is not an issue on the full sized version however. Honey-brushed confit of duck leg with celeriac purée, bok choi and star anise jus – Confit is a word that brings joy into the heart of any glutton and this is no exception. Duck leg is a meat that takes well to a confit with the rich unctuous fatty deliciousness, given a touch of sweetness with the honey. 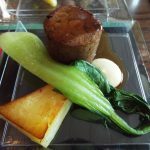 The celariac puree was a delight and I’m no stranger to a bit of bok choi, providing crunch and a touch of bitter to take away the sweetness of the meat. 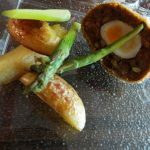 Yellow curry lentil scotch egg with asparagus & new potato salad (V) – This took the majority of us by suprise! I thought the lentils were going to be replacing the breadcrumb (me not noticing the little (v)), but they fully en-robed the egg, giving a really nice variation on the traditional scotch egg. The curry spices gave an almost fizzle on the tongue. Post munching, it was time for us to take our seats for the first act of Miss Saigon. I’m not going to spoil it too much if you haven’t seen it but you’re suckered in by the first minute. The whole performance is song based with little to no dialogue between each transition. However, it’s performed with such verve and gusto amongst incredible staging and set pieces, you’re instantly struck dumb with your eyes greedily trying to absorb each detail. The leads Sooha Kim (Kim) and Ashley Gilmour (Chris) gave incredible performances. My heart was won by Red Concepcion (The Engineer) providing humour amongst the drama, bouncing around the stage and eliciting cackles from the audience. The supporting cast (Ryan O’Gorman as John, Gerald Santos as Thuy and Na-Young Jeon as Gigi) were great with beautiful voices. The ensemble were amazing, every number was pulled off with panache and an energy. We start in Dreamland, The Engineer’s bar in Saigon and a popular hotspot for American soldiers looking for a good time and escape the horrors of war. It’s here GI Chris first meets barlady Kim and we get to see the blossoming of their relationship in contrast to the Us soldiers losing their grasp on the country. We see the repercussions of the USA’s involvement and the finale leads to The Engineer and Kim escaping Vietnam to Bangkok to try and reach America for a new life and a reconciliation with Chris. After a shocking finale to the first act, it was time for interval and for us bloggers a visit to the Gowling Suite, one of the private hire facilities available on site, for a quick run around the dessert menu. 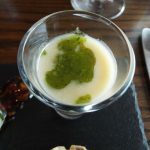 Green tea panna cotta with sesame tuille – The green tea panna cotta was nice, with matcha green tea giving a savoury sweet balance. Bitter chocolate tart with lychee, strawberry & mint compote – I’m a chocolate fiend so a bitter chocolate tart was always going to be a winner. A solid, sticky bitter and sweet tart, lovely with the strawberry and mint compote cutting through with an element of sharpness. Poached peach & pistachio cake with raspberries and vanilla set custard – Pistachio is something I usually come across as an ice cream flavour, so it was nice to see something a little different. The cake had a gorgeous soft texture and the nutty pistachios went well with the sweet peach. It was time to run back upstairs and reach the amazing finale. Again, another great opening piece to the second act which moves us from Saigon to Atlanta with Chris and John struggling to deal with post war life, their PTSD and John’s work with Bui Doi, the neglected street children left behind by GI fathers and Vietnamese mothers. We’re also introduced to Zoë Doano as Ellen, Chris’s new wife who has helped him to get over his post war trauma. Over the other side of the world in Bangkok, we see The Engineer and Kim’s new life echoing Dreamland in the first act, and their desperation in trying to reach America. By chance, they get in contact with John’s organisation which leads to a trip to Bangkok with John, Chris and Ellen. The tumultuous final scene leads to an end which will tug at the heart strings. A special mention must be made to the set dressings. They are, in a word, stunning with an amazingly quick turn around between pieces. 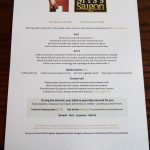 If you’ve not seen Miss Saigon before, or if you want to relive a previous production, I can’t recommend it highly enough and it’s great to have a food option to match and make it a full evening. Miss Saigon runs until Sat 23 September at Birmingham Hippodrome. For tickets, call Information and Sales on 0844 338 5000 or visit their website for details. Disclaimer: For this visit, I was a guest of Birmingham Hippodrome, arranged by Brum Bloggers, this provides no bias to the post. 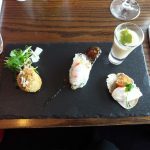 This blog is my own personal opinion and strives to provide an independent view, promoting, enjoying and reviewing the range of exciting food and venues in and around Birmingham.